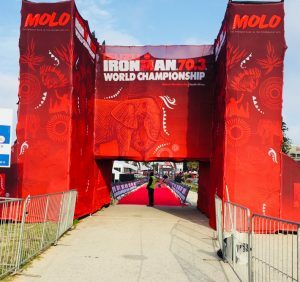 What an amazing experience it was to travel across the world to take part in the Ironman 70.3 World Championship event in South Africa. 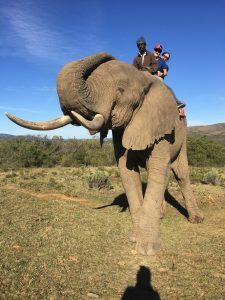 It was great to experience another culture as well as see and interact with animals in the wild. 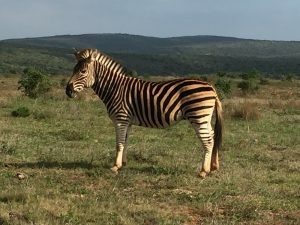 I am in awe of these amazing creatures. My favorite part of the experience however was the race. 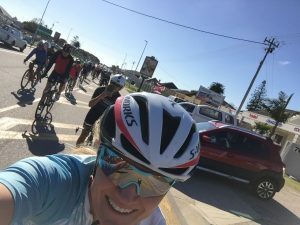 I loved being able to ride a portion of the route earlier in the week with fellow athletes and hear different languages and ride on the opposite side of the road. It was so nice that the WTC offered an escorted ride with police officers for the first 11K. It felt great to get my legs moving after many hours of catching planes, long lay-overs and lots of sitting. 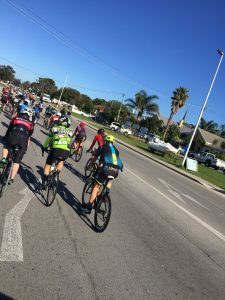 They did announce at our race briefing that we would be riding on the right side of the road as usual for American races, which I was surprised but glad about. 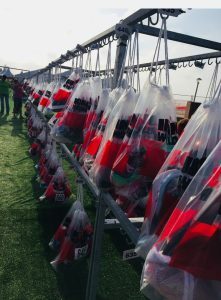 As usual with Ironman brand events the race was well organized. There were some differences that I really liked here verses the races I have done in the States. For instance, I loved how the racks were on the ground in transition; we didn’t hang the bike, so even though it got windy after the bikes were checked they were not swaying around hitting each other and getting damaged. They were also easy to remove from the rack during the race speeding up the transition. I also really liked how we hung our transition bags. For this race there were two transitions. It was so easy to find the bags hung in number order and run through transition quickly. After racking my bike and hanging my bags Friday night it was time to relax before the big event. I made sure and put RockTape on my knee and neck to help prevent neck chafing and give knee support. This stuff really sticks and helps, I love it! The next morning came quickly and before I knew it I was waiting anxiously in my swim wave corral. Unfortunately my age division was the last wave (12 of 12) and this is when the time seemed to go by slowly! 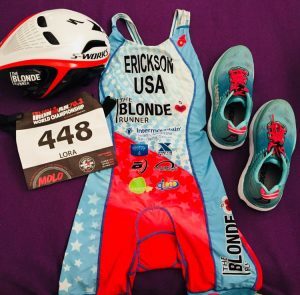 I choose to wear my sleeveless XterraWetsuit (use the code CO-BLONDE to save 60%) since it’s better for my shoulder and I am used to cold water. It was in the low 60’s, so not bad. Most people were in long-sleeve wetsuits however I made the right choice for me. Finally 8:58 a.m. came and we were organized into groups of ten leaving every 5 seconds. I was in the third set of this beach start. Soon the horn sounded and I was off digging my toes deep in the sand every push off until I hit deeper water. 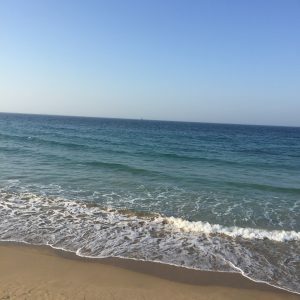 The swim starts we had practiced earlier in the week became useful now and I had a decent and cautious start swimming over the waves and quickly became accustom to the salt water in my mouth. I worked to sight the first yellow buoy and it seemed to come quickly. As I continued pushing through the blue water I noticed the waves becoming more choppy, the further I got from the shore, making it more difficult to site the bouys. I stopped a few times to get my bearings to make sure I could swim as straight as possible. As I rounded the last turn I could see the scuba divers under the water (I found out later they were there to keep the sharks away). Soon I was approaching the shore hoping to catch a big wave to ride in on but no such luck. I hurried through transition grabbing my bag and after getting my gear on I quickly made my way to my bike. 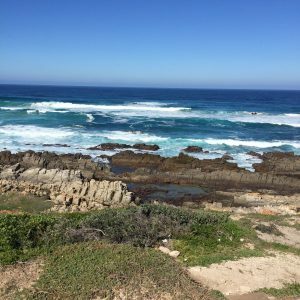 I was happy to get going on the bike and experience the whole ride; especially the parts by the ocean. What a beautiful ride! I learned from the practice ride that the roads were bumpy and there was potential for wind. 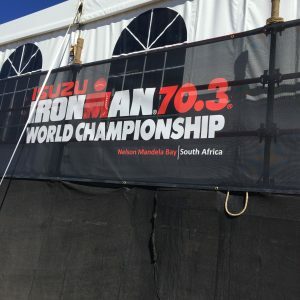 After all, Port Elizabeth is know as the “The Windy City,” as implied, it was windy on race day. Wind always makes me nervous so I slowed down on many occasions during the race. Safety first! There were some climbs but mostly the winds caused the slow downs. Overall I was passing quite a few ladies and many in other divisions so I knew I have made up some ground from the swim. 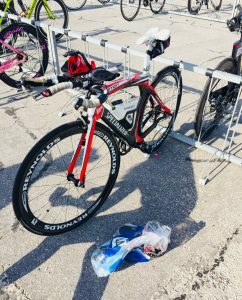 As I continued along the course I managed to get my nutrition as needed and take advantage of uphills and downhills passing many athletes as I pedaled my way to the next transition. My legs still felt a bit stiff and my hamstrings were tight from sitting so much on the long flights. As I came into T2 (the second transition) I was excited to experience this out-and-back run by the ocean. I love these type of routes! It allows for a lot of camaraderie with other athletes. I felt pretty good at first and tried to stay loose but as I ran along my hamstrings really tightening up more and became pretty painful. I had been nursing a strain so wanted to be careful not to push too hard. I tried to take one mile at a time and stay positive although I wasn’t hitting the pacing I had planned for. Thank goodness I was wearing my new Hoka Bondi 6’s which offers superior cushioning and undoubtedly helped me through the run much better. I was able to manage my nutrition well and was thrilled to be able to take water bags/satchets with me as needed. 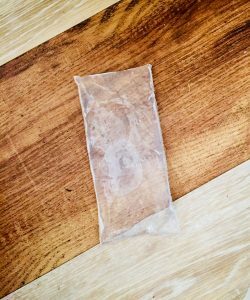 The water bags were new to me and I loved them! Ultimately it helped me to get more water and keep moving. They also had the usual sports drink (High 5 brand), gels, bars, Coke, RedBull etc… but no ice. At the start of the race it was mid-50’s as it was the first day of Spring in Africa so no need for ice. 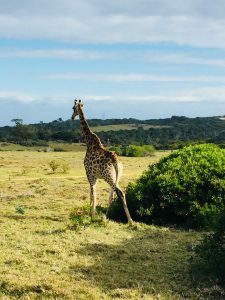 Also everything in Africa was in Kilometers. The speed signs for driving, and the race signs. I liked it because I always think of the half marathon in terms of 4 x 5K’s (I was a 5,000 meter runner in college) plus 1 mile so it was easy to know my splits. 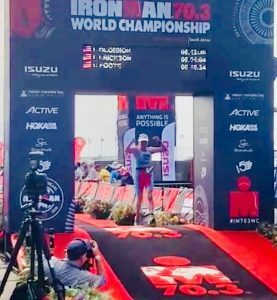 I pushed through each mile and was delighted to see the finish carpet and joyfully run to the finish strong completing my second 70.3 World Championships event. There is so much to learn from each race I do; overall it was a great race and amazing experience. There is something about competing against the best in the world that really makes a person determined to continue to improve and get stronger and better. 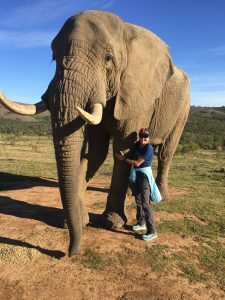 I am so grateful to those that made this race possible for me and it wouldn’t have been complete without a safari or two (more pictures below). Thank you to all those who support me! There were some other highlights outside of racing I wanted to mention. 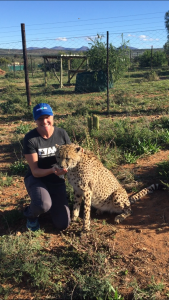 I loved petting a Cheetah as well as riding an elephant and seeing so many animals on safari.